I step outside our hotel in Meerut. Before our, always friendly, always smiling, drivers pack our group of five into a van and a compact car I venture out on to the road. The fog is dense. Like a giant thick cloud descending from heaven, dampening noise and limiting my sight to a bare minimum. The roads of India are a perfect metaphor for the richness, color and vibrant pandemonium that seems to constitute Indian life. On the road, all Indians come together. The government official in his ambassador car, the rickshaw driver with six schoolchildren as passengers, the ragpicker pushing his cart filled to the brim with plastics, the fruit seller with her oranges neatly stacked in a pyramid, the tractor driver, clad in his grey shawl at the wheel of a trailer bursting with wheat. Music plays from a nearby temple. The exotic Indian melodies and high-pitched singing gives the entire scene a surreal aura. I stand by the road, watching as cyclists, auto rickshaw drivers, trucks and cars appear like specters from the fog. For a brief moment the road seems empty, until a lone cyclist slowly materializes, creeping towards me. The music is the perfect score to this unreal scenery. Establishing a fleeting connection the cyclist shoots me a glance and floats by, disappearing on the other side. Immediately the normal traffic reappears. Trucks thunder by me and rickshaw cyclists scramble to maneuver the potholes on the road. I get into the car with A.J. With his giant mustache and infectious smile he seems like a comedian from a movie. Davinder, the other driver, stands tall and has the facial features of a movie star. I’m seated behind the front passenger seat. In the morning I like staring out the window, listening to music. The chaos on the roads offers something soothing, almost meditative. We drive off. Every day we pass tents of squatters on the side of the road. They sit huddled around low-burning fires in the morning, awakening to another day of work to make ends meet. I would like to ask about their lives, to understand what it is like to live in a tent by the road. We pass the tents quickly. My mind wanders off. The window of my car offers glimpses into the lives of countless Indians. Glimpses, not more. The window also separates me from them. I will never know where they are going, what their lives are like and who they are. But yet we are all on the road together, striving towards some destination, some goal that we have set for ourselves that particular day. The Indian country-side is an interesting sight. It is not composed of endless roads, winding through fields and empty landscapes. It is bustling with life at every corner. The streets are adorned with food stands, selling samosas, dosas and a variety of other foods. Tiny shops are perched next to each other on the side of the road, offering everything from toothpaste to pans. A variety of repair shops filled with bicycle and car parts complete the picture. 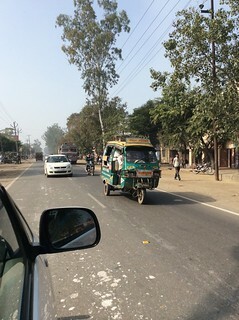 The diversity of travelers on the road is complemented by the mixture of people roaming the sidewalks. Bantering, bartering, clamoring, negotiating, buying, selling, hustling, walking, running, shuffling, limping, the people on the roads truly are a reflection of economic activity in India. As we near our destination, the landscapes around us change. From the countryside we move towards the city. 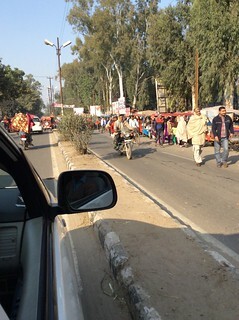 The roads get even more crowded and soon more than one or two lines of houses separate road from field. The traffic becomes more dense. The closer we get to the college we are working at, the more students you can see in their uniforms. Walking, running, driving, riding, striding to school. We finally stop at the college. As I motion to push open the door I snap out of my contemplative mood. 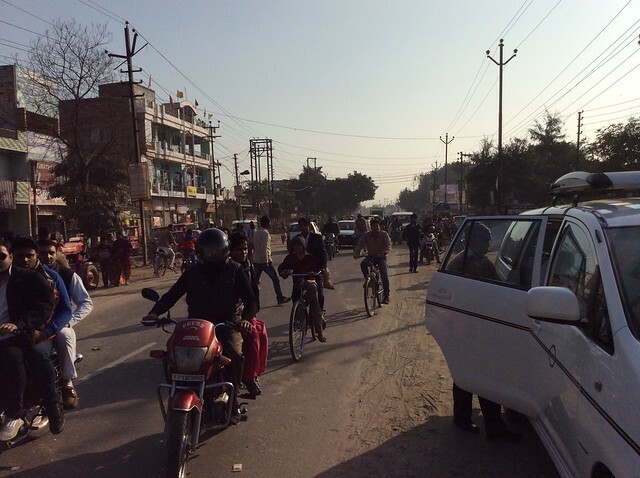 Another day spent on the roads of India – another day filled with glimpses of interesting lives and experiences. Post & Photos by Julius Danek. 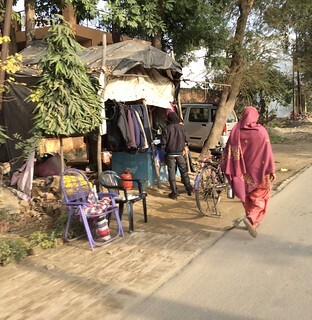 These observations about India’s roads were captured during Julius’ participation in a workshop researching the waste management system in Muzaffarnagar, Uttar Pradesh, India.